Here is a fairly uncommon title: Microsoft Access Business Information Access Program version 1.01. Nope, this is not the database software! 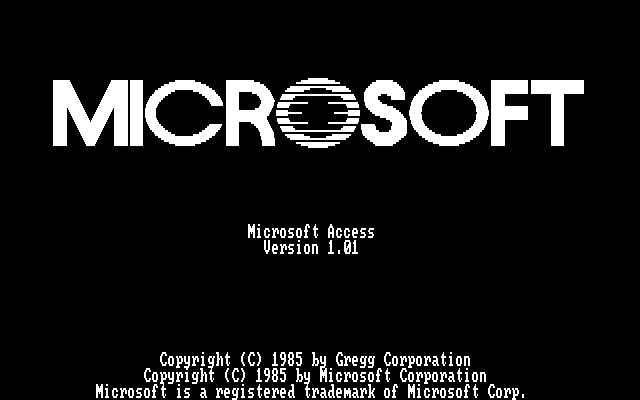 Released in 1985, the Microsoft Access Business Information Access Program is a telecommunications program that features VT100, VT52 and TTY terminal emulation, macros, a powerful scripting language, self-learning scripts, data import/export facilities, multiple windowed sessions, and built in support for a variety of on-line services. Compared to other mid 80s terminal emulator telecommunications programs, Microsoft Access BIA was relativity easy to use. It uses a consistent menuing system similar to Multiplan or Microsoft Word for DOS. Those more familiar with Macintosh style dropdown menus might, however, find it clunky. The program does not support the use of a mouse. To get going quickly, it includes a wide variety of predefined modem configurations, that need only be selected from a menu. Connecting to a typical remote source is fairly easy. DOSBox can use a TELNET connection in place of a serial modem. This software is not very well behaved. It would freeze up in DOSBox, and I had to boot a genuine MS-DOS image to get it to run. It also didn't like QEMU. The Microsoft Access Business Information Access Program has many advanced high-end features. It supports keyboard macros, a very powerful automation scripting language called "Microsoft Access Script Command", and can automatically "learn" new scripts. Access supports multiple sessions, and can display each session in a separate window, similar to Word for DOS. Unfortunately, it is not really possible to get screen shots of Access using these services as they are no longer around. The manual does show some sample screens. The software includes several file transfer protocols including X.PC and Xmodem. X.PC supports multiple communications channels on a single communications line. It includes data import/export tools that enable easy data exchange with programs like Microsoft Multiplan or Lotus 1-2-3. Access BIA bundles a copy of Notepad for DOS. This is a stripped down text editor similar to Word for DOS, that was also included on early Microsoft mouse driver disks. The posted version is "1.01". Interestingly 1.01 is NOT copy protected. The original 1.00 was copy protected, and reportedly was a bit vicious, similar to early Microsoft Word for DOS. This means 1.00 is still on the wanted list. The program is credited partially to "Gregg Corporation", that produced an earlier communications program called "Mainline". From what I can tell, Microsoft Access Business Information Access was not a very popular program. At the time, there was a plethora of similar telecommunications programs, and it clearly got overtaken. 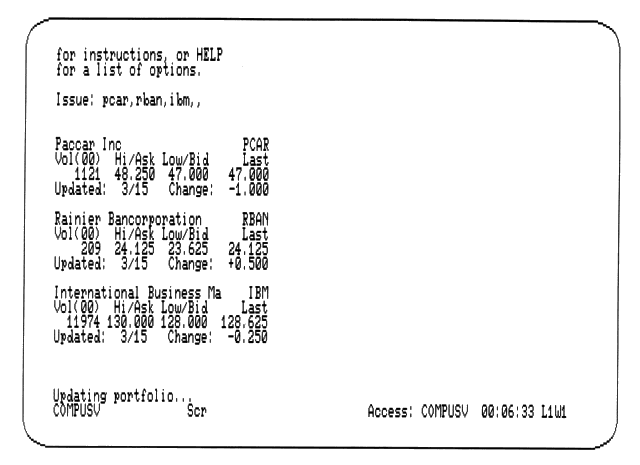 At least by the late 80s, the market was sort of split between low cost/shareware terminal programs for home use, and powerful mufti-faceted script-able telecommunications programs for corporate use. Access really didn't fit in, as it tried to be both. The very fact that its name was recycled suggests Microsoft never thought much of the product. It is a little confusing how to even refer to it. "Microsoft Access Business Information Access Program" is a bit long, "Microsoft Access BI" sounds like an enterprise-y Business Intelligence program, "Microsoft Access BIAP" sounds kind of odd, perhaps just "Microsoft Access BIA" for short? So there you have it. Another rare title preserved thanks to WinworldPC - your primary source for unloved software used as Bill Gate's door mat. Nice find SomeGuy I saw Microsoft Chart 1.0 in 1983 on ebay listing on winworldpc Microsoft Chart 1.0 1983 will be find for winworldpc. One we will found Windows 1.0 Comdex 1983 Edition and Windows 1.0 Byte 1983 Edition. thank for founding this rare software. Thanks for noticing. There is so, so much out there that needs to be archived and I just can’t get them all. That Quarterdeck Desq 1.0 sold for more than I wanted to bid. That MS Chart 1.00 and other like that early MS Word 1.00 for DOS or that copy of the IBM UCSD-P system are sitting out there at prices higher than could afford. BTW, If another version of MS Access BIA ever comes up, I’m not sure there is any way to externally tell if it is 1.00 or 1.01. I only saw the version number printed on the disks and the registration card. I went on Access it get me error No communication devices found.